Early on Easter morning 1886, around a hundred people gathered at the Henry Clay Statue outside A. M. Hill Jewelers at St. Charles and Canal. Hill stood dressed in a riding outfit of brown corduroy and knee britches. Charlie Fairchild, Hill’s 23-year-old employee, arrived wearing his riding costume of blue flannel shirt, blue knee britches, and blue woolen stockings. In his pockets he carried a pocketbook, a toothbrush, and a bottle of cologne, and from his shirt pocket dangled a watch and chain. Just before 6 o'clock, the appointed time of departure, Harry Fairfax, a nineteen-year-old reporter for his father's paper, The Daily Item, appeared, rolling his high wheel bicycle up Canal Street in the company of his parents and a party of young ladies. These three members of the New Orleans Bicycle Club planned to ride from New Orleans to Boston, 1500 miles, in 30 days. Their destination was the national meet of the League of American Wheelmen. Other cyclists at that time were making long-distance tours across the United States and around the world. 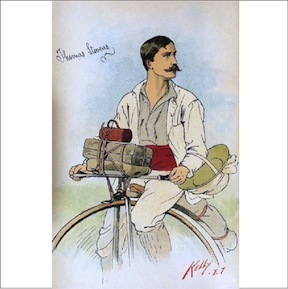 Thomas Stevens was simultaneously making his way through Asia that spring after having already cycled across North America and Europe. 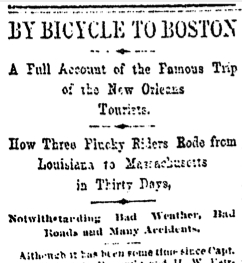 The three cyclists from New Orleans were the first to attempt a long-distance ride across the South. Roads were lacking and maps were non-existent, so the crew was forced to find its way as they went, often riding on railroad tracks. The bicycles they rode were “penny farthings,” the high wheel bicycles of the 1880s. They had outfitted their machines, two Rudge Light Roadsers and a Columbia Roadster, with the latest equipment. Strapped to the handlebars of each was a bundle of oiled cloth containing all they hoped they'd need for the next month: an extra suit of underwear, a pair of short pants, silk stockings and light shoes for the evenings, a rubber rain coat, an old bed sheet to be torn up for bandages and handkerchiefs, needles and thread, and toiletries including a toothbrush, a comb, a bottle of Pond’s Extract, and plenty of bandaging plaster. Their tour proved arduous, as they met with record rainfall, boggy roads, flooded streams, and repeated injury. On the evening of May 24, 1886, they arrived in Boston with one day to spare. 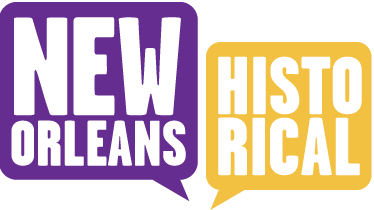 Lacar Musgrove, “1886 Cycling Tour: New Orleans to Boston,” New Orleans Historical, accessed April 24, 2019, https://neworleanshistorical.org/items/show/502.